I made this card quite some time ago when stamping with some friends and I just never got around to posting it. So now I'm finally sharing it with you. Some of the products have since retired, but I bet you could re-do the same card with current supplies and it would be just a beautiful if not more! Crumb Cake card stock 5-1/2" x 8-1/2", scored at 4-1/4"
Pool Party card stock 3-1/4" x 4-1/2"
Very Vanilla card stock 3" x 4-1/4"
Fold the Crumb Cake card stock on the score line. Stamp the En Francais background image onto the card front in Soft Suede ink. Sponge Soft Suede ink around the edges of the card front. Next take the piece of Very Vanilla card stock and stamp the flourish image from Flowering Flourishes onto the card stock in Pool Party ink. 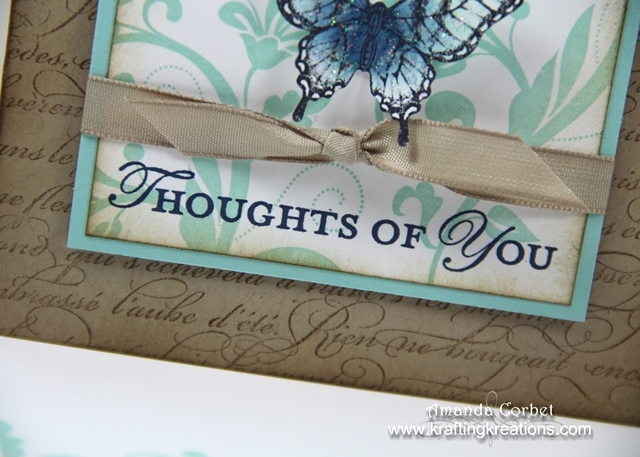 Stamp the greeting from Loving Thoughts onto the bottom of the card stock in Midnight Muse ink then sponge Soft Suede ink around all four sides. Glue the stamped Very Vanilla card stock onto the Pool Party card stock. Wrap the Crumb Cake ribbon around the panel just above the greeting and tie it into a knot. 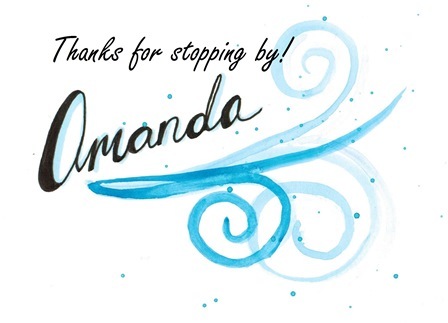 Stick this layer onto the card front with a few Stampin' Dimensionals. Now for the butterflies! 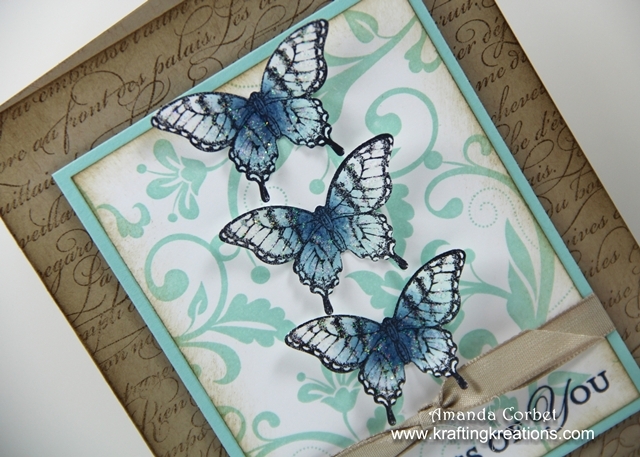 Take a scrap of Very Vanilla card stock and stamp the butterfly image from Papillion Potpourri three times in Stazon ink. Take a sponge dauber and sponge Pool Party ink in just the center of the butterfly. Then sponge Midnight Muse in the center of the butterfly making sure you don't cover all of the Pool Party ink. 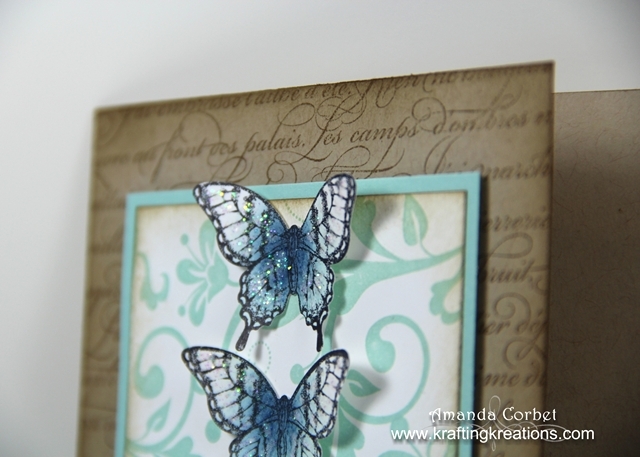 Punch out each of the butterflies with the delicate butterfly punch and glue them onto the card front all in a row with Glue Dots. To add a little shimmer to the butterflies scribble some Dazzling Details onto the wings of the butterflies an allow it to dry. For the envelope I just stamped the image from Flowering Flourishes a couple times in the lower left hand corner in Pool Party ink and sponged Soft Suede around the edges.